Over 12,000 bus routes all across Singapore & Malaysia & Thailand. Choose from more than 60 bus operators for online bus booking. Save the fuss of having to go to coach counters to purchase your tickets and reduce unnecessary expenses, i.e travelling cost to coach counters just to buy/collect paper tickets. Save the trouble of "No Ticket": Plan your travel by securing your bus tickets before traveling. 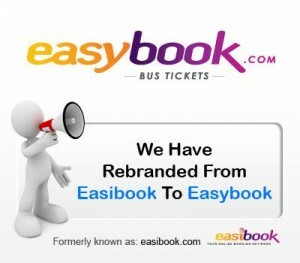 Use easipoint rewards in saving money and at the same time, earning easipoints by booking your bus tickets online. You can buy, extend and claim online, even after you've left home. Travel insurance from WorldNomads.com is available to people from over 140 countries. It’s designed for adventurous travellers with cover for overseas medical, evacuation, baggage and a range of adventure sports and activities. Over 20K Accommodation Across Asia from travelmob. Book Now!